The thyroid gland is located in the front of your neck just above the breastbone and below the Adam's apple. 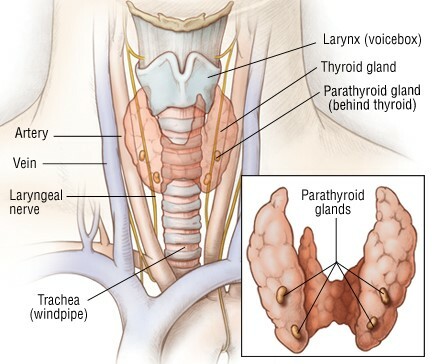 The small, two-inch gland consists of two lobes, one on each side of the windpipe, connected by a small bridge of thyroid tissue called the isthmus. The thyroid plays an important role in regulating your body's metabolism. Virtually every tissue in the body is affected or regulated by thyroid hormone. It regulates the brain and nerve development and function, skin, hair, eyes, heart, and intestine function. You have a nodule that might be thyroid cancer. You have a diagnosis of thyroid cancer. You have a nodule or goiter that is causing local symptoms – compression of the trachea, difficulty swallowing or a visible or unsightly mass. You have a nodule or goiter that is causing symptoms due to the production and release of too much thyroid hormone – either a toxic nodule, a toxic multinodular goiter or . A hemi-thyroidectomy or thyroid lobectomy – One lobe (one half) of the thyroid is removed. A total or sub-total thyroidectomy - Removal of all or most of the thyroid tissue. The recommendation as to the extent of thyroid surgery will be determined by the reason for the surgery. For instance, a nodule on only one side of the thyroid may be treated with a hemi thyroidectomy. If you are being evaluated for a large goiter on both sides of the thyroid, or a large thyroid cancer, then a total thyroidectomy will probably be recommended. However, the extent of surgery is both a complex medical decision as well as a personal decision and should be made together with you, your surgeon and endocrinologist. Surgery may also be recommended for nodules with benign biopsy results if the nodule is large, if it continues to increase in size, or if it is causing symptoms such as discomfort or difficulty swallowing. Surgery is also an option for the treatment of hyperthyroidism (Grave’s disease or a “toxic nodule”) or for any enlarged thyroid gland or goiter that may be causing symptoms. Are there other forms of treatment? Surgery is the most effective treatment to remove nodules suspicious for thyroid cancer. If there is not the possibility of thyroid cancer, there may be nonsurgical options for therapy depending on your diagnosis. You should discuss other options for treatment with your physician who has expertise in thyroid diseases. These complications occur more frequently in patients with large cancers, in patients undergoing a second thyroid surgery, and in patients with large goiters that go below the collarbone into the top of the chest (substernal goiter). Overall the risk of serious complications should be less than 2%. Prior to surgery, patients should understand the reasons for the operation, the alternative methods of treatment, and the potential risks and benefits of the operation. How much of my thyroid gland needs to be removed? Your surgeon should explain the planned thyroid operation, such as lobectomy (hemi) or total thyroidectomy, and the reasons why the procedure is recommended. For patients with papillary or follicular thyroid cancer, your surgeon may recommend a total thyroidectomy when they believe that additional treatment with radioactive iodine might be necessary. For patients with larger (>1.5 cm) or more invasive cancers, and for patients with medullary thyroid cancer, local lymph node dissection may be necessary to remove lymph nodes. A thyroid lobectomy may be recommended for overactive nodules or for benign one-sided nodules that are causing local symptoms such as compression, hoarseness, shortness of breath or difficulty swallowing. A total or sub – total thyroidectomy may be recommended for patients with Grave’s Disease or for patients with large multinodular goiters. Will I need to take a thyroid pill after my operation? The answer to this depends on how much of the thyroid gland is removed. If half (hemi) thyroidectomy is performed, there is an 80% chance you will not require a thyroid pill UNLESS you are already on thyroid medication for low thyroid hormone levels. If you have your entire gland removed (total thyroidectomy) or if you have had prior thyroid surgery and now are facing removal of the remaining thyroid (completion thyroidectomy) then you have no internal source of thyroid hormone. In this case you, will need lifelong thyroid hormone replacement. Thyroid replacement pills are taken daily and tend to be well tolerated without side effects. The thyroid gland is removed through an incision in the lower part of the neck. The size will vary depending on the type of surgery and the size of the gland. The incision is closed with dissolving stitches and either skin glue or steri strips. The incision can get wet in the shower 1-2 days after surgery. It will have some mild to moderate swelling for about two weeks. The most important care for your scar is to keep it out of the sun. In Colorado the sun rays are intense and can cause scars to be more visible. You should keep the area out of direct sunlight, cover it, or apply sunscreen to the scar daily once the skin has healed. This should be continued for the first six months after surgery. Generally, after about a year, with good care to the site, most scars are barely visible. What restrictions will I have following surgery? Most surgeons prefer that patients limit extreme physical activities following surgery for a few days up to about a week for most patients. This is mostly to reduce the risk of a postoperative neck hematoma (blood clot) and breaking of stitches. These limitations are brief, usually followed by a quick transition back to unrestricted activity. Normal activity can begin on the first day following surgery. Vigorous sports, such as swimming, and activities that include heavy lifting should be delayed for at least ten days to two weeks. Patients can lead very normal lives once they recover from surgery.